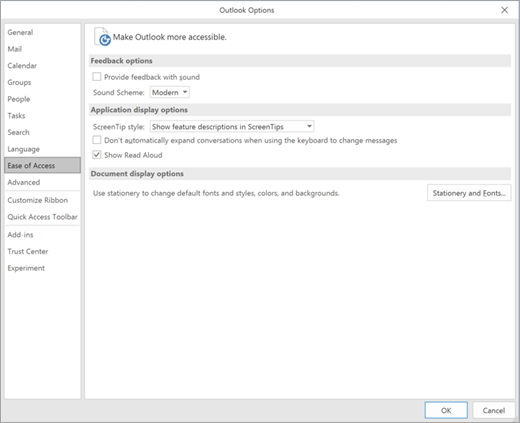 Immersive Reader in Outlook Online and Read Aloud in Outlook desktop allow you to hear the text of an email read out loud while following along. 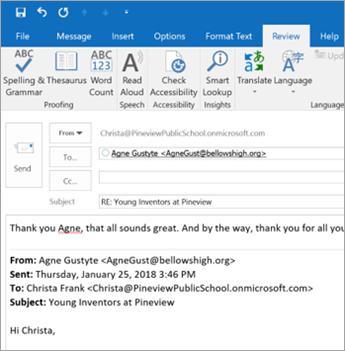 Outlook Online also offers tools for changing the spacing of lines and words to make them easier to read, as well as tools to highlight parts of speech and syllables. 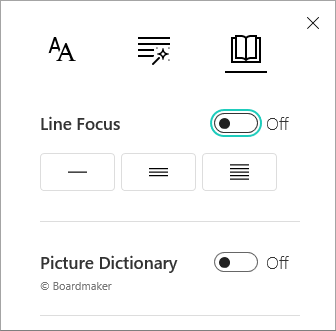 See which Immersive Reader features are supported in your language for Outlook Online and desktop. Log in to your account at Office.com, and select Outlook. Select the More Options icon ( ... ), then Show in immersive reader. To hear the paragraphs read to you, select the Play button. To listen from a certain point on your page, select that word. Select the gear icon to open Voice Options. The Voice Speed slider controls the playback speed of the reader. 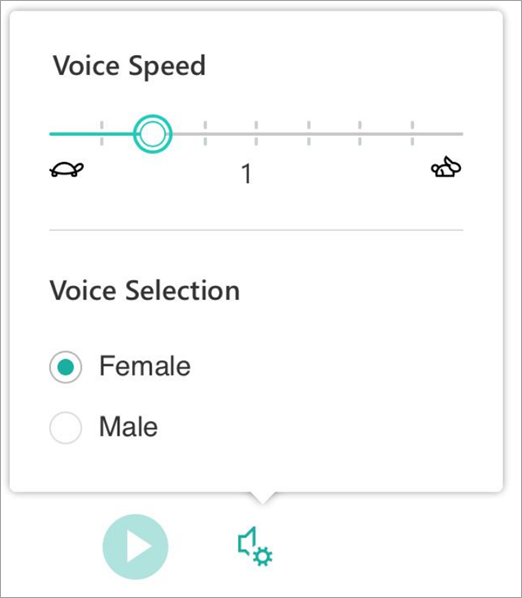 Select Voice Speed, then drag the control to the right or left. Move to the right to increase speed and to the left to decrease it. Press Play to hear the different speeds. You can change the appearance of your document by using Text options. The choices you make in text options can help remove visual distraction and improve text readability. 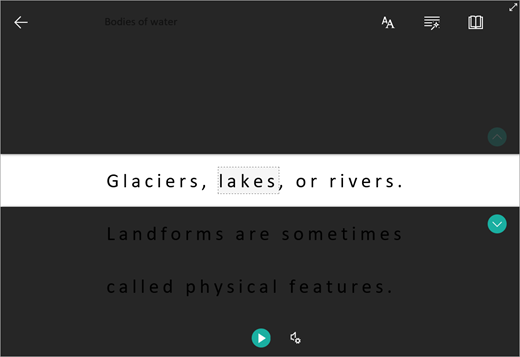 Parts of Speech controls grammar highlighting and helps readers understand complex sentences. 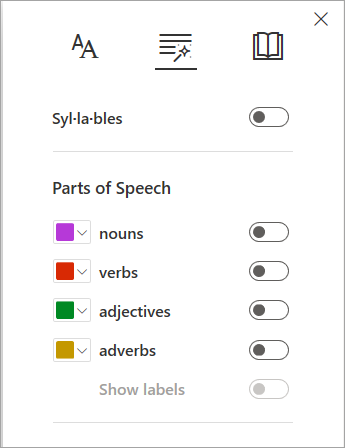 To use, select Parts of Speech (looks like three books). Syl·la·bles splits words by showing small dots between syllables. Under Parts of speech, turn on Nouns, Verbs, or Adjectives to highlight every noun, verb, or adjective on the page in a color that corresponds to the color of the label. Use keyboard shortcuts to navigate. Open your Outlook desktop application. Select the checkbox next to Show Read Aloud. From an email you're reading, select Read Aloud in the Message tab. From a reply message window, select the Review tab, then Read Aloud. The reader will start reading immediately. To listen from a certain point in an email, select that word. Otherwise, the reader will begin with the first line of text in your message. A toolbar will appear after you've selected Read Aloud. Select the Pause icon to stop listening. Use the toolbar to Play, Pause, and skip to the next or previous paragraph using the arrows. Drag the Reading speed control to adjust reading speed. Move to the right to increase speed and to the left to decrease it. Press Play to hear the different speeds. 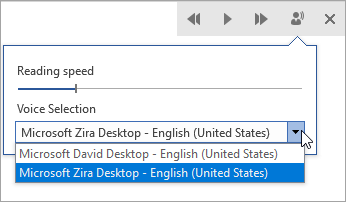 Use the Voice Selection dropdown menu to choose different voices for the reader. Select a voice and then press Play to hear it. Select the X to close Read Aloud.